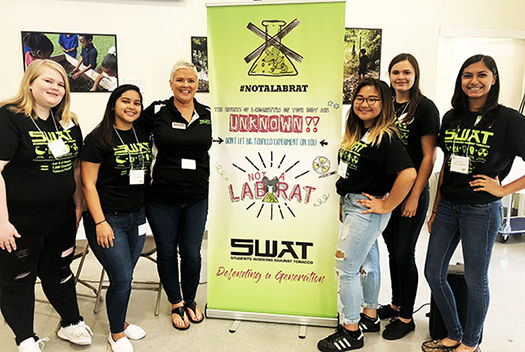 Florida’s Students Working Against Tobacco (SWAT) program hosts regional youth meetings annually where SWAT members from various counties come together to learn new information and skills. SWAT Coordinator Courtney Moyett and five of her SWAT Club student leaders from Okeechobee High School attended the Region 4 SWAT Training on June 9th, 2018 at the FAU Environmental Center in West Palm Beach. This year’s theme for the meeting was “I am not a lab rat” which focused on how Big Tobacco is using our youth to experiment on them with Electronic Cigarettes. The youth learned all about what Electronic Nicotine Delivery Systems (ENDs or E-Cigarettes) are, different flavors of them, health implications of using, and marketing tactics used by Big Tobacco. Due to the astronomical rise in popularity of the E-Cigarette Juul, there was an entire learning session on what Juul is, how it differs from regular ENDS, how much nicotine is in each pod, and who Big Tobacco is marketing Juul to. The call to action for the ENDs campaign stresses the three E’s of ENDS: Educate, Empower, Enlist. After Lunch attendees were introduced to a new project called “Photo Voice.” Photovoice is a process in which people can identify, represent and enhance their community through a specific photographic technique. Students were showed examples of photos that could be used to tell a story within our community and were given guidance on how to implement this technique within our community. Overall, the meeting was impactful and inspiring, and the students who attended from Okeechobee County left feeling excited to be a part of such an important program, and they were overflowing with ideas for how they can share their newfound knowledge with their peers.